The seeds for Norman's destruction were sown the moment he was appointed to replace Stark, for he made a pact with a group of beings that were truly incapable of cooperating. The formation of Norman's Cabal and the subsequent deal that was struck is explored here. Although Namor was Osborn's most direct antagonist, Loki proved to his more subtle and more detrimental one. Loki's undermining of Norman's rule took numerous forms and it began soon after Norman publicly announced his new Avengers roster. Loki infiltrated the Hank Pym-led Avengers (aka The Mighty Avengers) and he took the form of the Scarlet Witch to do so. The God of Mischief caused blood to rain from the skies and Norman was forced to reinsure the public that everything was fine (explored further here). Loki even cut deals with members of The Cabal itself as he conspired with Dr. Doom to have Dr. Donald Blake (aka the human host for Thor) killed in Thor #603. In exchange for Doom killing Blake, Loki trapped his fellow Asgardians and handed them over to Doom for him to experiment. Doom was trying to use the Asgardians to make himself immortal. Another Cabal member, The Hood, accepted aid from Loki as the Mischief God restored the Hood's powers using the Asgardian Norn Stones. Loki allowed The Hood to keep the Norn Stones in New Avengers #57, a gesture that was part of a much bigger plan. Loki had set the table and it was time for Norman to eat and the meal was a big bowl of crazy. A combination of Loki's plotting and Norman's own mental instability caused Norman's edges to continue fraying in Dark Avengers #14. As Norman walled himself up in his workshop, Victoria Hand became determined to redirect him from the dangerous path on which he set himself. Hand recommended that he get professional counsel as well and Norman reluctantly agreed to do so, but also made her check on Ares' strategy for attacking Asgard...because he was going to do that too. Just when it seemed as though things could not get worse for Osborn, a dark ominous cloud began to settle of New York City as The Void/The Sentry returned. The Void began wreaking havoc across the city, attacking thousands of innocent civilians. The violence forced Norman's hand and he confronted his Avenger in the skies above the city. He urged The Sentry to cease his attack as he claimed that actions like these will guarantee that either Reed Richards or Tony Stark will find a way to kill him. Norman's rationale appealed to The Sentry and suddenly the black clouds dissipated and The Sentry became obedient. Osborn told him that he would call him later that night with a task for him. When Norman returned to Avengers Tower he went straight to Bullseye's quarters and told his assassin to The Sentry's wife when Norman gives him the signal. 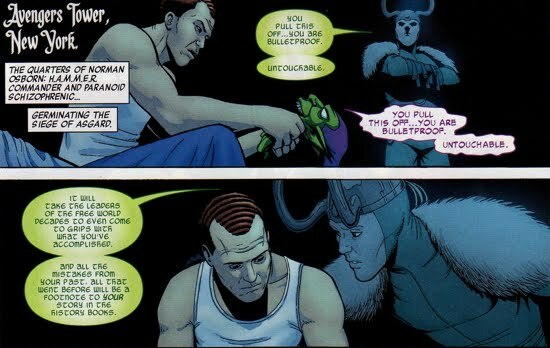 While Norman's Avenger team was self-destructing, Loki moved to a more direct form of manipulation...a one on one conversation with Osborn. After explaining the history behind the nine realms that comprise the universe, Loki informed Osborn that Asgard did not belong on Earth (aka Midgard) in the Origins of Siege one-shot. His reasoning was that it was a danger to both his people and the people of Midgard and in that manner he felt that both Osborn's and his interests were in line. Osborn did not trust Loki initially, but soon saw the logic behind Loki's rationale so he complied and a deal was struck to remove Asgard. But everything was not as it seemed and as Norman sat in his dark quarters clutching his Green Goblin mask, it appeared as though he was not talking his own dark alter ego...rather Loki was placing thoughts inside his head. In the one-shot Siege: Loki, it was revealed that Loki was in there alongside Norman, coaxing him to attack Asgard and convincing him that he was capable of doing so. With Loki's manipulation in full-swing, it was time for Norman to ensure that his fellow Cabal-mates were onboard as well. In the one-shot Siege: The Cabal, Norman informed Dr. Doom and the rest of the Cabal about his plan to attack Asgard. But before Norman could get to business, Doom made demands upon Osborn, requiring him to 'reverse his course of actions against [Namor]'. 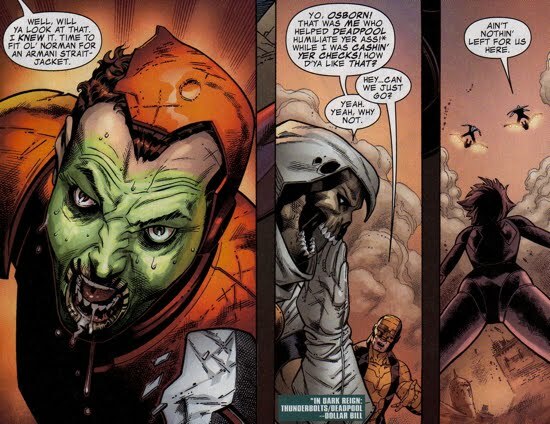 Osborn refused and told Doom that it was time to support Loki's request in the same manner that they supported the return of Latveria to Doom. Osborn told Doom he wanted Asgard overthrown so that Loki could restore it to its rightful locale. 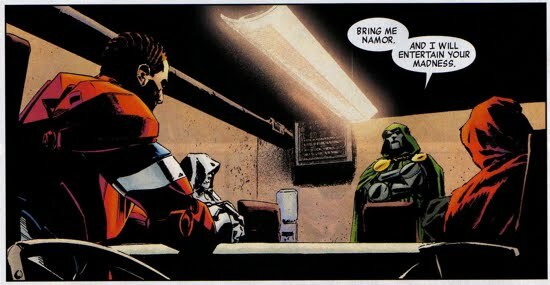 Doom was not buying it and he told Osborn to produce Namor and he might consider listening to his plan. Norman could tell that Doom would not be swayed so he broke out his secret weapon, The Void, who blasted Doom through the wall in a fiery blast. Loki and The Hood bail out as Doom's lifeless corpse converted into millions of tiny swarming Doom-bots that began attacking Osborn and forced him to evacuate the Avengers Tower. Norman's Avengers quickly assemble and are instructed by Victoria Hand to flee the Tower in their Quinjet. The Sentry (having reverted back to his human form after attacking Doom) brought his wife to the evacuation site and left her with rest of his Avengers team. Upon Osborn's command, The Sentry annihilated the Doom-bots and quickly neutralized their threat. With the Doom-bots defeated, Norman sends a message to Doom via these tiny machines telling him that his attack on Osborn was a mistake. 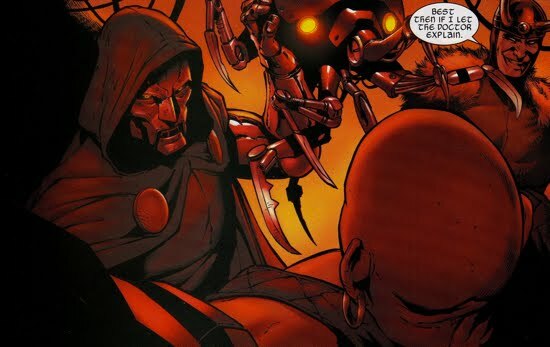 In return, Doom ends his affiliation with Osborn and even makes a veiled threat toward his son Harry. Meanwhile, Bullseye received the signal from Osborn to kill Lindy and after The Sentry had brought her to 'safety' with his fellow Avengers, Bullseye took Lindy on a solo helicopter ride. In Dark Avengers #15, Bullseye made good on Osborn's request to kill Lindy by snapping her neck and throwing her dead body into the ocean waters below. After the dust settled around Avengers Tower and Norman's team returned to their headquarters, The Senty went ballistic when he did not see his wife emerge safely with the rest of the team. Bullseye lied to The Sentry and told him that she killed herself by jumping from the helicopter somewhere over New Jersey. The Sentry then converted to his Void and nearly killed Hawkeye, The Sentry was eventually able to calm down and he left in a panic to find his wife's dead body. Norman had made up his mind or perhaps Loki had made it up for him, either way, he was certain that he should invade Asgard. He was also savvy enough to realize that he needed as much muscle as possible to do so, therefore he turned to his fellow Cabal-mate The Hood to enlist his crime syndicate for the invasion. In a flashback sequence in New Avengers #64, Osborn and The Hood met at the recently decimated (from Doom's aforementioned onslaught) Avengers Tower where Osborn requested The Hood explain the source of his newfound power-set. The Hood showed Osborn the Asgardian Norn Stones and he explained that Loki told him that these magical stones pick their master. Because of that, their magical powers could only be used by The Hood and no one else. Norman then requested that The Hood join him in his invasion and The Hood agreed because of the deal he had with Osborn along with the fact that Osborn had remained very loyal to him. The Hood's syndicate would take more convincing so Osborn told him about his new plan for the Thunderbolts franchise, a plan which would see the Thunderbolts Initiative replace the Avengers franchise. In this new world order, Osborn explained that The Hood would run it and his men would be his generals. As an added bonus, they would receive special forces immunity, which was essentially a get-out-of-jail-free card if they were to join this invasion and the subsequent Thunderbolts franchise. The Hood knew that would be a powerful bargaining chip and it did work, Osborn was able to recruit The Hood's entire crime syndicate to fight in the Asgardian invasion. Soon after, Osborn contacted the President of the United States in order get approval for his attack on Asgard. But the President did not approve, instead he encouraged Osborn to focus on the incident that had just occurred at the Avengers Tower (aka Doom's swarm attack bots). After Osborn failed to convince the President as to the urgency of the Asgard situation, Loki offered up some useful advice. He told Norman that he needed an incident to garner support for an attack on Asgard, an incident dramatic enough to open people's eyes to the 'threat' Asgard represented. Norman agreed and Loki took care of the rest. 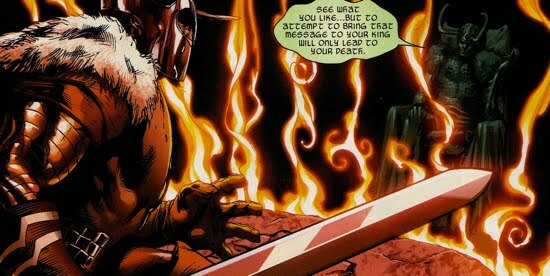 Without delay, Loki handed Osborn his incident in the form of the Asgardian warrior Volstagg. 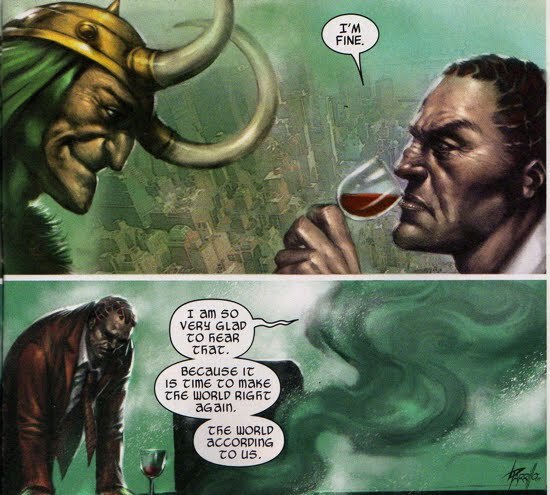 In Siege #1, Loki explained that Volstagg was naive toward human nature and that he was unaware of the effect that his power would have when unleashed upon mortals. To further ensure Volstagg's imminent blunder, Osborn and Loki sent the U-Foes (who were a part of Osborn's Initiative explored further here) to confront Volstagg and antagonize his forceful response. The result was a massacre in Chicago, specifically Soldier Field during a Bear's game, as the entire stadium filled with innocent civilians perished in a fiery blast as a result of Volstagg's and the U-Foes actions. According to Avengers The Initiative #32, at least two thousand people died that evening. The members of The Resistance (the group that formed as a result of Osborn's restaffing of the Initiative program) quickly deduced that Osborn had staged the Soldier Field massacre because they knew the U-Foes were on his payroll. The Resistance was ready to oppose Osborn's attack. Norman now had his proof and cause to invade Asgard and remove the threat that it posed. Ignoring protocol, Osborn assembled his Avengers and the full roster of his Initiative and prepared them for the invasion. Despite Norman's request for their participation in the attack, his team was quite reluctant to get on board and rightfully so, they realized they were heavily outmatched. Ares was the most obstinate, he told Norman that if he's wrong about the threat level posed by Asgard, that he would cut off Norman's head, armor and all. Norman lied to Ares in order to get his full endorsement of the attack, he told him that Loki was in control of Asgard, not Balder, and that Loki must be removed from power. Ares eventually complied. The rest of his Avengers were hesitant as well, but Norman told them if they came through on this request he would consider their obligations to him complete and that they could freely leave the team. Norman did not waver on his effort to maintain solid PR, in Siege: Embedded #1 the Iron Patriot along with the rest of his Avengers are seen cleaning up after the mayhem at Soldier Field. To further bolster his public support, Norman enlisted one his biggest television proponents Todd Keller, who's broadcast runs on the Patriot News Network, to be the voice of Norman's invasion. Norman used various members of the media to cover the invasion, saturating the various networks in an attempt to have the public see the invasion as 'he intended them to see it'. 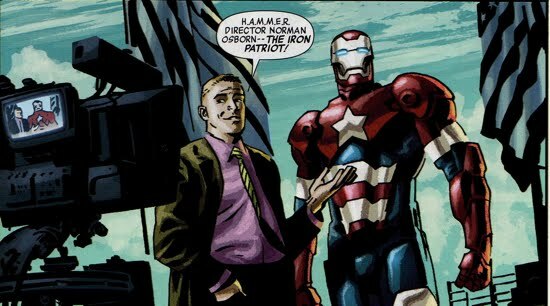 In Siege: Embedded #2, Norman used a robotic decoy of the Iron Patriot to appear on Keller's broadcast of the attack. This allowed Norman to be in multiple places at once, all the while keeping a lid on the truth behind the invasion. Meanwhile, the President struggled to get in contact with Osborn and dissuade him from his invasion, but Norman ignored his calls and went forward with his plan. Norman and his team took flight from New York and made way to Broxton, Oklahoma, the city in which Asgard hovered above. Whilst Norman was en route, the manipulative Loki went to Balder and warned him of Norman's impending attack, but Balder did not believe the God of Mischief. Unfortunately for Balder, Loki was not lying and soon Balder found out for himself as The Sentry blasted through the fortified walls of Asgard. 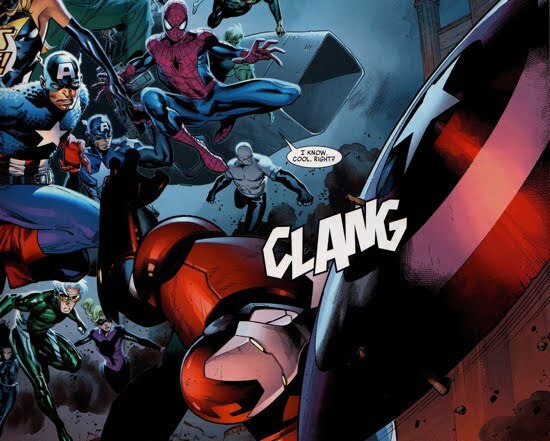 The Iron Patriot and his Avengers were close behind and their invasion was officially underway. Ares had devised a strategy for attack which centered around neutralizing Asgard's main lookout, Heimdall the Asgardian protector. The second phase of Ares' initial attack strategy on Asgard was to destroy the Bifrost, a legendary rainbow bridge that allowed Asgardians to travel between the nine realms. Soon after Ares formulated his plan, Osborn and his team were on their way to Oklahoma. Although it appeared as though Loki was solely sabotaging Norman's invasion, it was soon revealed that that was not entirely the case. In Thor #607, Loki relocated Heimdell's bedchamber 'deep into the stony guts of Asgard', a location which made it impossible for Heimdell to pass word on to his King that an invasion was arriving. Loki was greasing the wheels for Norman's first wave of attack. 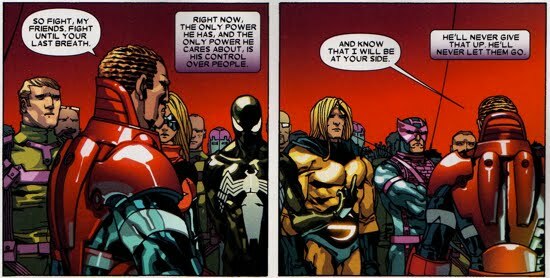 Osborn did not shy away from playing the fearless leader role, in Dark Wolverine #82 Norman addressed his attacking fleet as they prepared to lay siege to Asgard. Daken, as expected, mocked Osborn to his face while he attempted to rally the troops. Osborn shook off Daken's jokes and continued on with his speech telling his fleet that he'll be 'protecting of [them] with his last breath'. 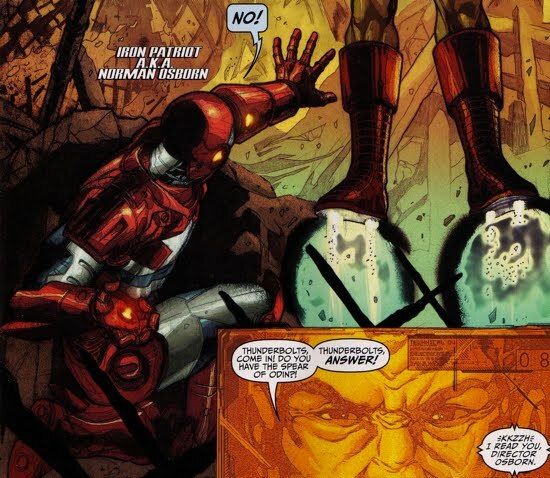 Daken matched Osborn's feigned compassion with antagonism, as he worked to get under both Osborn and Bullseye's skin prior to arriving at Asgard. Norman also left a pre-recorded message with an assignment for his black-ops Thunderbolts squad in Thunderbolts #141. He commanded his team to avoid the front line and to head for Asgardian armory on the south side of the land mass. The armory housed The Spear of Odin, a powerful weapon without a magical safeguard, which meant that even a mortal could wield it. Norman wanted it brought to him immediately and soon after the team arrived at Asgard for their next mission. Unfortunately for Norman, insubordination was a common theme amongst his various teams and The Ghost was no exception. The Ghost intentionally sent Osborn's message to Amadeus Cho who alerted the rest of the Mighty Avengers about the plot to steal the Spear of Odin. The Mighty Avengers immediately took route to Asgard to stop the Thunderbolts. The sheer scale of Osborn's forces alerted all of the Oklahoma-locals to his presence, including Dr. Donald Blake, who quickly converted to Thor and prepared to defend Asgard. As Thor swooped in for a direct attack on Osborn, The Sentry swiftly neutralized the Thunder God's attack. Seconds later, The Iron Patriot, Ms. Marvel, and the U-Foes mercilessly blasted Thor nearly killing him. Even some Avengers Initiative members got in on the action as the Taskmaster and Diamondback also contributed to the thrashing Thor recieved. The media caught every minute of their attack on Thor and the broadcast eventually reached Steve Rogers, who realized it was now time to make a stand. Interestingly, in Avengers The Initiative #33, Osborn scolded the Taskmaster for gloating over the battered Thor claiming that the Taskmaster's efforts had minimal (if any) contribution to defeating the thunder god. He then commanded Taskmaster to return to the battle on Asgard but requested that Diamondback stay at the scene so that the media would report her involvement. Diamondback deduced that Osborn did that because had formerly been a partner to Captain America, ergo her presence added legitimacy to Osborn's actions. But she had now witnessed first-hand the depth of Osborn's evil and she had a change of heart regarding her allegiance to the Iron Patriot. 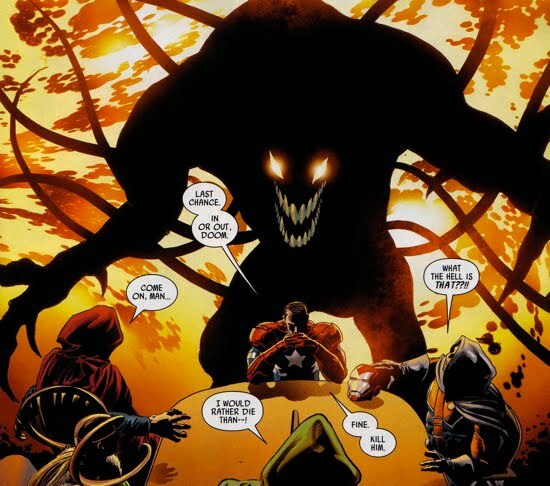 The lack of camaraderie within Osborn's Avengers team reared its ugly head almost immediately during their attack. In Dark Wolverine #82, Daken attempted to hand Osborn over to the Asgardians, a complete betrayal of his leader. 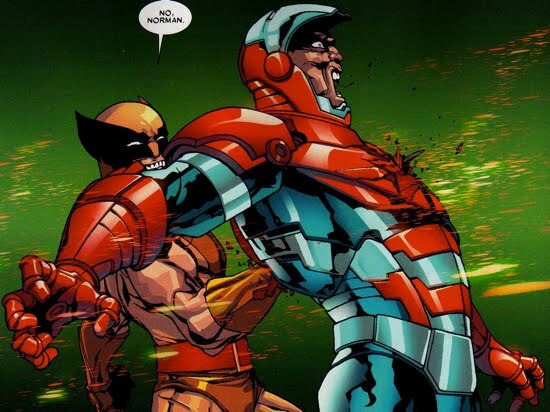 Luckily for Osborn the immortal Daken told did not trust him and before Daken could explain, the Iron Patriot blasted the head off of the Asgardian. When Osborn confronted Daken and gave him new orders, Daken ignored his command and instead distracted Osborn so that he could literally stab him in the back! 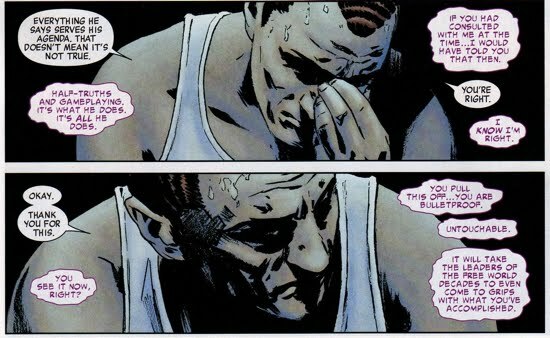 It appeared as though Daken had mortally wounded Osborn but it turned out to be a delusion he had experienced whilst being manipulated by the Fates. The Fates were a trio of Asgardian oracles who believed Daken would bring about Ragnarok, the Asgardian end of the world. Daken did not deliver. He did, however, continue to bicker with Bullseye and the two nearly killed each other out on the battle field. And they probably would have if Norman did not arrive and urge them to continue fighting the enemy. 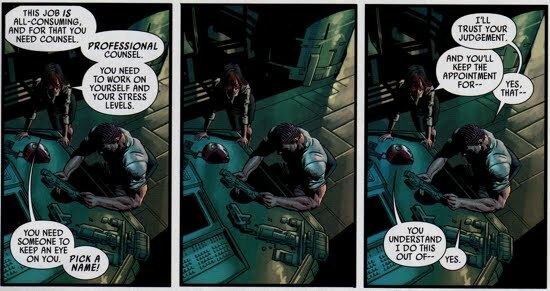 Osborn's futile attempt at a morale boost had no effect on Daken and he eventually bailed out on the invasion, to follow his escape continue here. The attack on Asgard was in full-swing at the onset of Siege #2, as mortals and immortals clashed in a massive blood bath. Ares battled Balder as the God of War scolded Balder for allowing Loki to take the throne of Asgard. Suddenly, Heimdell intervened and corrected Ares naive understanding of Asgard. It was at that moment that Ares realized that he had been lied to and he swore revenge upon Osborn. But Norman had his own problems, Maria Hill had joined the fray and launched a missile at Osborn forcing him to flee his position. A missile that could have been avoided if Diamondback had reported to Osborn after seeing Hill arrive at the scene. But since Diamondback wanted to cut her ties to Osborn, she allowed Hill's missile to cruise through and nearly kill Osborn. Eventually Ares caught up to Osborn and was about to make good on his vow to cut off Norman's head for lying. And just when it appeared as though Osborn was about to meet his fate, The Sentry once again swooped in and neutralized his former friend Ares. The two traded blows and it appeared as though Ares was holding his own, but soon The Sentry ripped Ares into two (literally!) and instantly killing him. The Void had fully set in. At this point, Steve Rogers had rallied his allies and apprised them of the situation in Oklahoma. Using a S.H.I.E.L.D. military helitransport, Fury and Rogers gathered their team (which included Osborn's long-time nemesis Spider-Man) together and they made their way to Broxton. 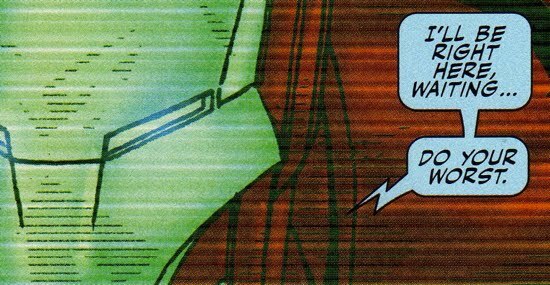 In the one-shot Siege: Secret Warriors, Fury, just prior to leaving for Broxton, taunted Osborn and let him know that he was on his way to defeat him. Norman's response... (see below). At the conclusion of Siege #2, The Iron Patriot was about to come face-to-face with the man who's iconic image he had stolen, Captain America. Perhaps the phrase shield-to-face would be more appropriate as Cap sent his shield hurling toward Osborn like a cruise missile! 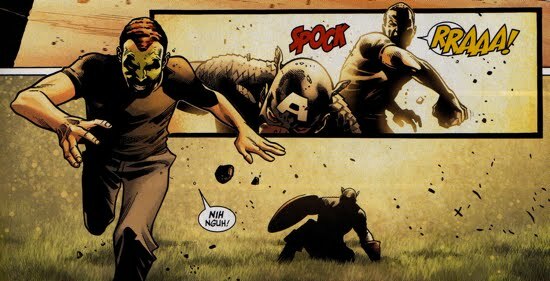 Captain America's shield hit Osborn like a ton of bricks at the onset of Siege #3, and Cap did not arrive alone, he had a whole of Avengers behind him. Meanwhile, back in Washington D.C., the President was being apprised by his staff as to all of Norman's recent transgressions. The President was none too pleased with Osborn's direct insubordination so he ordered the Avengers leader to be placed under arrest for treason. Luckily for the President, Captain America had arrived just in time to do the deed. As Osborn watched Cap and the others flood the battle's front line, he commanded Loki to summon The Hood and his men in order to level the playing field. Loki complied and it seemed like Osborn was going to be able to fend off Captain America's arrival. But Cap had other plans, he sent the Young Avenger Speed to Maria Hill's hideout, which also happened to house the incapacitated Tony Stark. Speed brought Stark a present, one of his old Iron Man armored suits, one that would not have been corrupted from the Skrulls (or anyone else for that matter). As the President ordered H.A.M.M.E.R. to be taken down, The Sentry and Thor engaged in a true clash of the titans. Captain America continued his assault on the Iron Patriot and suddenly Osborn realized that his armor was beginning to corrupt, leaving him quite vulnerable. 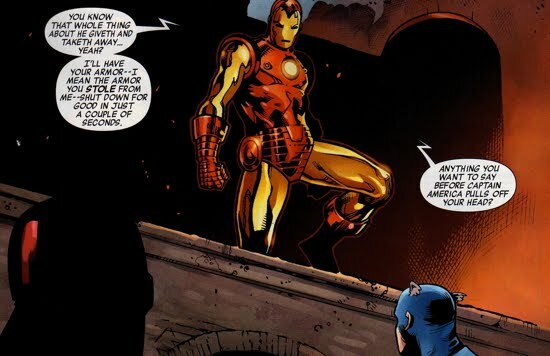 As Osborn's Iron Patriot armor underwent a systems failure and began to shake uncontrollably, he fell to ground and standing above him was nemesis Tony Stark. Stark told Osborn that he would have Osborn's armor (actually the armor Osborn stole from Stark) shut down for good in a few moments. Realizing his defeat was imminent, Osborn shouted to The Sentry, "Don't let them! Bring it down!". The Sentry did not hesitate, he released Thor from his clutches and made a bee-line through the core of Asgard. Within moments, the floating realm above Broxton came crashing to the ground and was completely reduced to rubble. 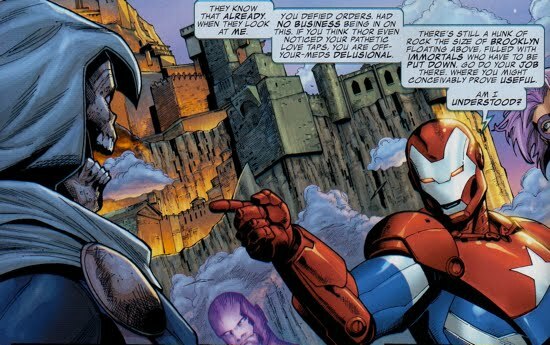 Thunderbolts #143 supplemented Osborn's final moments as the Iron Patriot as he commanded his team to bring the Spear of Odin to him immediately. As Stark seized control of Norman's armor, Scourge responded to his boss and told him he was on his way over. Scourge had just wrestled the spear from the Mighty Avengers, but en route to Osborn it was his own teammates that proved to be worthy adversaries. Paladin, fed up with following Osborn's orders, shot Scourge point blank in the face and took the spear. Paladin rolled the dice and intentionally disobeyed Osborn's directive, he left with the spear and promised to make sure that it did not have it fall into the wrong hands. Luckily for Paladin, Norman's power was usurped so there was no recourse for his final (and noble) deed as a Thunderbolt. Osborn was finished, Captain America placed him under arrest and Stark removed the Iron Patriot armor. But Norman was not completely out of surprises, for underneath his Iron Patriot mask Norman had painted his face green (toward the likeness of his dark alter ego The Green Goblin). Osborn's descent into madness was clear for all to see, he began rambling about how the others had 'no idea what they had done!!'. Before Norman could finish his sentence, Spider-Man socked him in the face and tossed an insult his way (see below). Interestingly, in Avengers The Initiative #35, Norman's unmasking went down a bit differently. It was Luke Cage who kept Osborn in a head-lock whilst Captain America cracked him with his shield, breaking his face shield and exposing Norman's green face pain. The Taskmaster took that opportunity to come clean to the distraught Osborn and tell him that he was he that helped Deadpool defeat his Thunderbolts a few months back. Osborn writhed around on the ground babbling incoherently whilst exclaiming 'you're all dead' and that 'he [Norman] was the only one who could stop him'. Spider-Man and the others had no idea what he was talking about, but then Osborn pointed to the sky above him and it became abundantly obvious who he was referring to, The Sentry. However, he was not The Sentry anymore, he had fully embraced his Void alter ego and he sat high in the dark skies above with long spider-like legs protruding from his body. The action culminated in Siege #4, as The Void's ominous dark energy pervaded the land and caused the collection of heros to struggle to stay on their feet. But then the rather unexpected occurred, Loki, having just witnessed the destruction of his home realm, felt regret for his actions and prayed for his father's forgiveness. In one the most ridiculous scenes from Norman's downfall, Loki claimed to have not been aware that his mischief was only meant to return Asgard to greatness and he could not perceive madness brought upon by the mortals (really?! 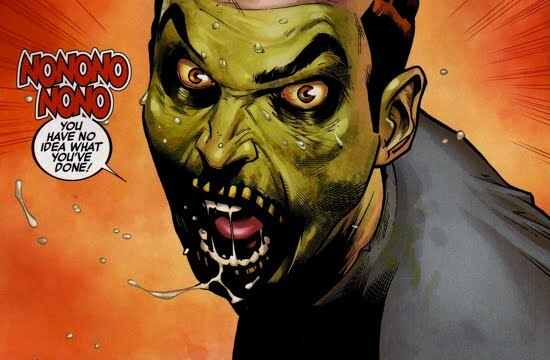 ?, but he was the one who tinkered with the mad Norman Osborn in the first place!). Just after Asgard had come crashing to the ground, Loki was confronted by Balder for his participation in Osborn's attack on their home realm. In Thor #609, Balder's rage toward Loki's deception (err...mischief) caused him to exile Loki from Asgard. After literally being tossed aside into the rubble, Loki reassured himself that Balder could exile him but he could not stop Loki from saving Balder. Loki used the power of the Norn Stones to empower the heros who fought with honor. Suddenly, Captain America, Spider-Man, Thor and the others were rejuvenated and imbued with a power that allowed them to take on The Void. Thor and others unleashed upon The Void but it was not quite enough and Loki knew what must be done. He brought the Norn Stones in direct contact with The Void and his self-sacrifice led to a fiery blast that seemingly destroyed both he and The Void simultaneously. As the dust settled only one being emerged, The Void, he was still not defeated. Stark then used the H.A.M.M.E.R. helicarrier as a giant bullet to launch at The Void, the result was another giant explosion that created another diversion for Osborn to escape Captain America. While Cap was distracted, Osborn cracked him the back of his head with a rock then made a run for it. But his second escape was as futile as his first, as Volstagg was there to stop him this time, a fitting revenge since it was Osborn who used Volstagg to incite the war. 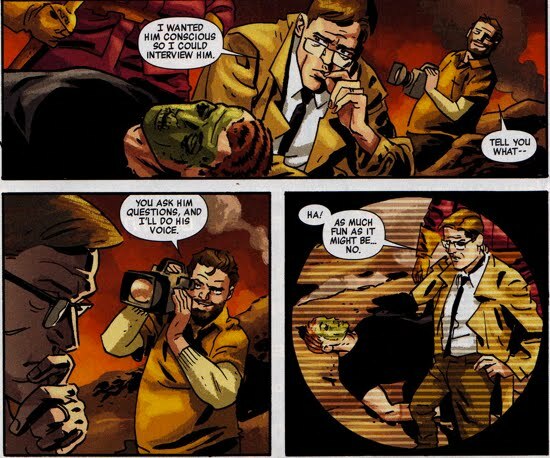 In Siege: Embedded #4, Ben Urich was depicted as witnessing Volstagg's thwarting of Osborn's escape. Urich, of course, wanted a conscious Osborn to interview, but he was not going to get that. In a small bit of comic relief, Urich's cameraman offered to fake Osborn's voice whilst Urich interviewed the incapacitated Osborn. Urich was tempted but declined, citing that the real story was the true heros that stood up to Osborn's reign, so he decided to focus his story on them. The helicarrier bullet that Stark sent toward The Void seemed to work, as a naked Robert Reynolds laid on the ground. But it was too late for Reynolds, The Void was still in control and he quickly converted back to the spider-like Void. The Void's run would come to an abrupt end though, as Thor struck down upon him with one final blow from his hammer The Void was instantly killed. 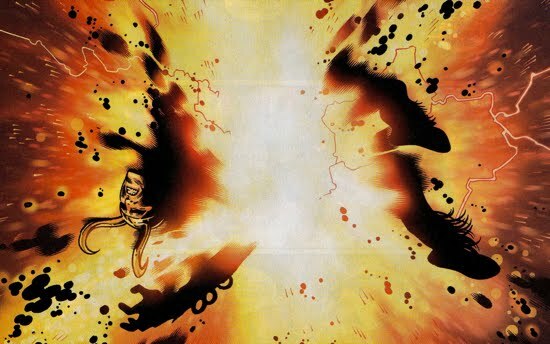 Thor then flew The Sentry's lifeless body to the sun, vaporizing his corpse. 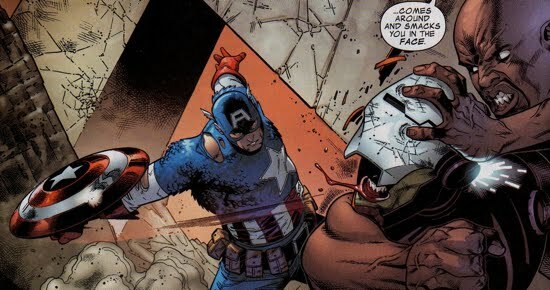 Volstagg most likely handed Osborn back over to Captain America because it was Cap who finally tossed Osborn on the ground in line with the rest of the surrendered detainees. Cap then told the others he wanted to see Osborn to pay for his crimes and see trial in an American court. In the days that followed the President handed Osborn's role over to Steve Rogers and planned for Osborn and his team to see trial. 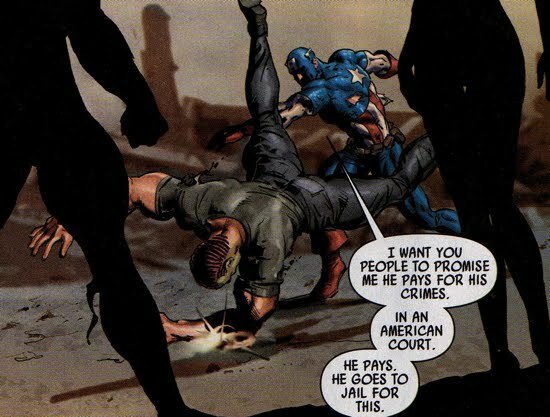 Todd Keller, Osborn's strong supporter, showed his true colors and flipped sides to supporting Steve Rogers once he was appointed Osborn's position. Keller proved to be a spineless lackey to whoever was in charge. The President also shut down H.A.M.M.E.R. and threw out the Superhuman Registration Act it seemed to be a happy ending for Captain America and the rest of the true Avengers. The Heroic Age was officially underway.